Editor’s note: This post was submitted by the European regional sensing journey group. Actually, we started a little earlier: On Thursday April 7th students and other interested individuals gathered for an informal seminar, hosted by the Network for Future Global Leaders (NFGL), a network for international students who have been provided with scholarships by the Swedish Institute. 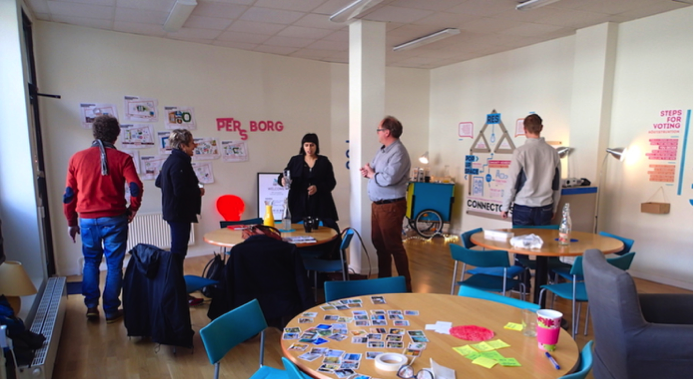 The arrangement took place at the premises of the Center for Public Entrepreneurship – a third sector initiative to promote social innovation initiatives (see more info below). At the seminar David Graf spoke about The Global Leadership Academy and Fredrik Björk about being a part of the Global Wellbeing Lab, but also briefly about the Leadership for Sustainability Master’s programme at Malmö University, which some of the students present at the seminar are following, and where Fredrik is one of the teachers. 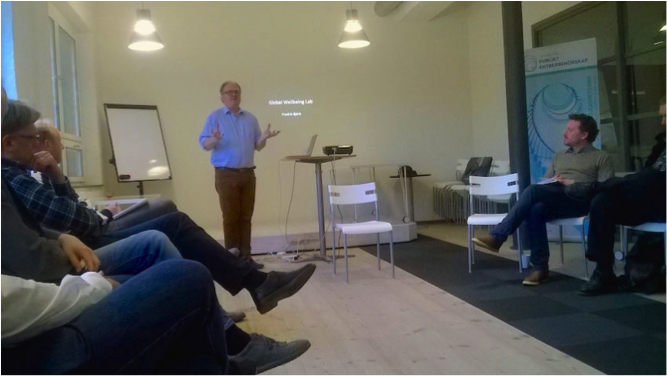 One of Fredrik’s key approaches is to think about leadership as a process, and a social practice – related to negotiation, collaboration, learning and sense-making. Another aspect is the relationship between leadership and learning, as it is often argued that sustainability is essentially about learning. 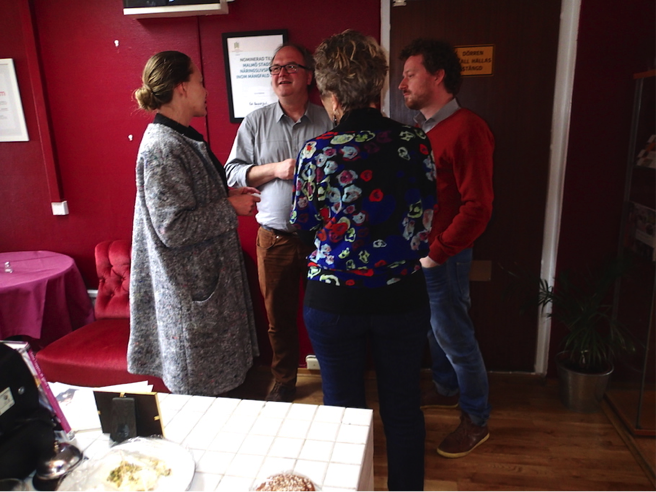 The discussion at the seminar also touched upon several other topics – not least about the Gross National Happiness approach and the challenges of complex metrics and using proxy data. FIFH – a 50 year-old sports club, for ’disabled’ athletes with a strategy to focus on abilities and human resources instead of shortcomings. They are also working with a number of projects concerning labour market and societal integration for their members (read more). After meeting up at the Hotel, we took the local bus to Rosengård to visit Yalla Trappan. Here we met with the chairman of the board – Christina Merker-Siesjö, Dortha Trusz, project manager for “Y-allas väg till arbete” (Y-everyones way to a job), and Victoria Arlemark, director of operations as well as some of the women who work in the kitchen. Yalla Trappans premises are in Rosengård, an area with a large immigrant population. Here unemployment is high and income is low. The place is small but colourful, warm and inviting. At arrival we were treated with coffee and Middle Eastern sweets. We did “walking interviews” with Dorotha and Christina. Dorotha shared her story about how she came to Sweden 20 years ago, and lived a life similar to that of many immigrant women today – more or less in a parallel society. Eventually she became involved in Yalla Trappan, during its project phase. The entrepreneurial approach appealed to her, as she has a background as an entrepreneur in Poland, and she felt she could make use of her skills at Yalla Trappan as well as being a role model for other immigrant women. “Y-allas väg till arbete”, where Dorotha is currently project manager, is a project run by Yalla Trappan, focusing on immigrant women with short education and limited skills in Swedish. Here they are trained in professional cooking skills and learning Swedish. Among the house rules are no talk about religion and no talk about your health. The food is for Yalla Trappans restaurant as well as for catering, and has become increasingly popular, not only in the neighbourhood. There would probably not have been a Yalla Trappan if it wasn’t for Christina Merker-Siesjö. She was project manager in the project phase, and has since become chairman of the board for the social enterprise. During the walk, Christina told us about her life, how she had always been involved in solidarity movements and working for human rights, in Sweden and abroad. 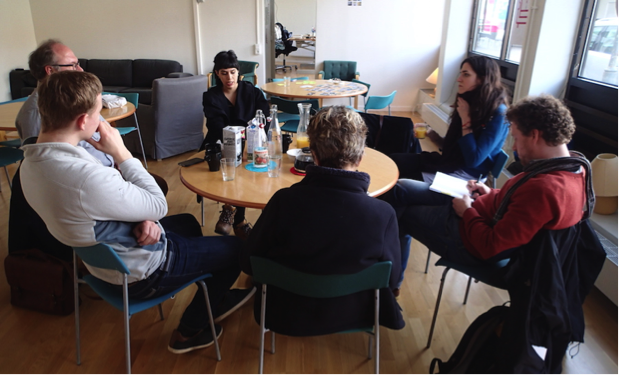 When arriving back to Yalla Trappan we met a group of school children from a wealthy part of Malmö that did a study visit to Yalla Trappan, Christina immediately took the opportunity to talk to them. Have you been here in Rosengård before? What do you think about Yalla Trappan? And then informing them about what Yalla Trappan is about. After lunch at Yalla Trappan, we continued with local bus to meet with Connectors Malmö – at their “Residency/Hub”- project in Persborg. 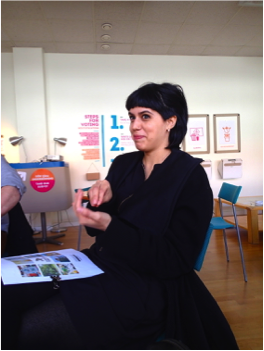 Here we met with Julieta Talavera, an exchange student from Argentina, who is co-director of Connectors Malmö. The “residency/Hub” is an initiative to work from the perspective of human-centered design in order to develop the square in the middle of the Persborg neighborhood, and make is more attractive and appealing. The project is mostly funded a grant from MKB, the municipal real-estate corporation. Built almost 60 years ago, it is today a bit run-down. Shop spaces are unoccupied and the area is also struck by some violence: Just outside of the unused shop space where Connectors are running their project, a guy as shot in both legs a few weeks back. Julieta is vibrant and enthusiastic, and nobody can question her engagement. She told us about how they are working with different methods to approach the local residents – like going out in the streets with their coffee cart to invite people to discuss how the area could be developed. The empty shop space is one part of this – Connectors are promoting this as the worlds’ first “pop-up living room”, where all interested can take part in designing the space. The overall goal for Connectors, is come up with a model or concept on how to engage with local residents, and to be able to spread this to other cities as well. 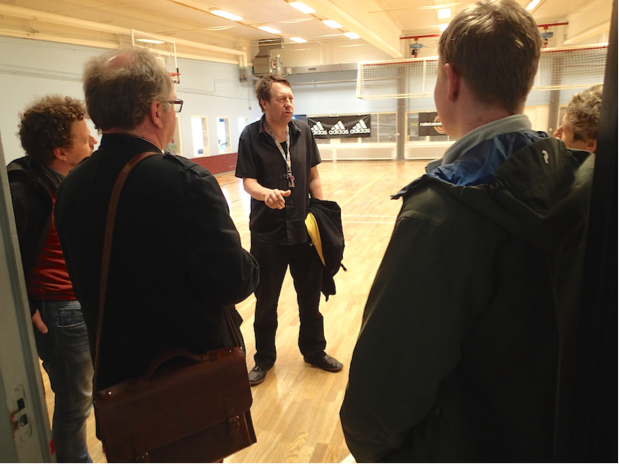 From Persborg, another bus ride took us to the sports arena where FIFH have their office. Here we met with Sinisa Kedza, coordinator for FIFHs international projects. Sinisa welcomed us with a warm smile. He’s lived in Malmö for 20 years, after coming as a refugee from Bosnia. At first he worked as a teachers’ assistant, but eventually an auto-immune disease made increasingly difficult for him to taka part in the regular labour market. At FIFH, his experience as a basket player in former Yugoslavia became an asset in developing projects together with sports clubs for disabled athletes in several countries in the Balkans, where, as Sinisa says, “people with disabilities are not supposed to really take part in society”. With support from FIFH, however, several of these clubs have now become much more visible in their local communities. Some of them have even, with support from FIFH, been able to arrange their own international competitions, based on FIFHs “Malmö Open” concept. Malmö Open is, after Paralympics, the largest sports arrangement in the world, arranged by FIFH every year in early February since almost 40 years. Here more than two thousand disabled atheletes from all over the world compete in a number of different sports – from Table tennis to Wheel-chair Rugby. The experience from arranging Malmö Open has been invaluable to FIFH and it’s members – making it evident that having a disability doesn’t disable you from creating great things! The experience from arranging big events have also been an inroad to other projects. Work oppurtunities for the disabled have become increasingly scarce in a more competitive labour market, and FIFH are actively working together with stakeholders both from business and public administration to develop a number of capacity-building projects. 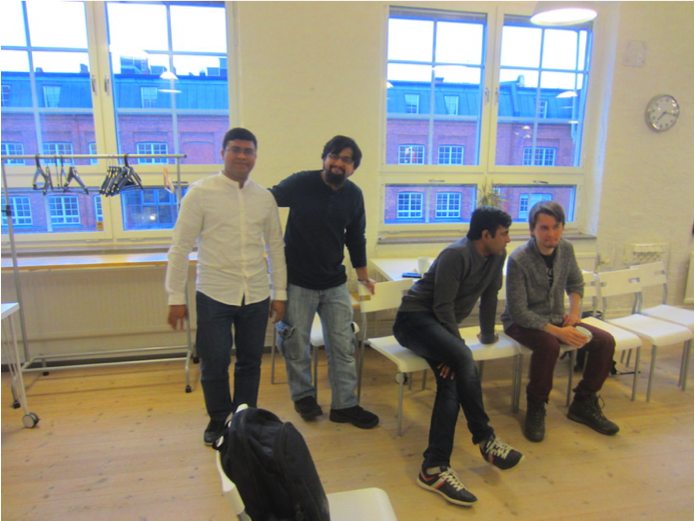 Starting with some time on our own at Yalla Trappan and then on Thursday April 9th, at the Center for Public Entreprenurship, we reflected on what we had experienced. In addition to discussing the people and organizations that we met, a lot of the discussions was also about Sweden and Malmö, anything from politics to policy, the values of Swedish people, history and present trends. A common experience was that we were greeted with warmth and enthusiasm at all the initiatives we visited. There was an openness and honesty, a willingness to share, that was difficult to resist. Another aspect was that nearly all that we met had non-Swedish background, but many had lived in Sweden for decades. Some of the initiatives – Yalla Trappan and Connectors – had a strong focus on the local neighbourhood. Still, they all gave an impression of disconnected pockets of engagement. This was also true for FIFH, who complained that even though they are one of the largest sports clubs for disabled athletes in Europe, they are not well-known in Malmö. It feelt great to meet the women working at Yalla Trappan. You felt the transformation they had experienced! It was easy to understand the situation these women had been in before, socially excluded from the society and now they were proud and happy, with a very warm atmosphere in their restaurant and coffeshop. Their knowledge was appreciated and they were needed. To visit a restaurant like Yalla Trappans is a really good experience that you feel for a long time. The other people we met were the social entrepreneurs, enthusiastic to do good and make a change. This included the staff at Yalla Trappan, Connectors Malmö and FIFH. Sometimes it is easy to overlook the old organizations for the new and fancy. FIFH was the organization actually reaching the largest group of people with a track record of more than 50 years. They were not very fancy, but did important efforts anyway. One reflection was that it could be an idea to connect them with Connectors Malmö, they could maybe make use of some “young energy”. Instead we connected them with Roberts friend in Manila, who is a board of trustee member of the special Olympics of the Philippines. Something that was evident, was that to understand the people, the challenges and the initiatives, there’s a need to understand the context – cultural, economical, social etc. An important explanation for this can be found in the World Values study, where it is evident that Sweden is a somewhat “strange” outlier country. We have strong secular-rational values, meaning less emphasis on religion, “traditional” family values and authority and a government that take care of many things for us. At the same time we also have strong self expression values, meaning that we are giving a high priority to the environment, tolerate immigrants and people that do not fit with the norm and have a rising demand for participation in economic and political life. Many of these things are good! Robert shared that being married to a woman from a country with extremely strong family values, meant that he had to re-learn some things as an adult, for example how important strong and good family relations are for your wellbeing. There might be a risk, in a culture like this, that people become “standardized” – everybody fits the norm – which doesn’t provide good conditions for creativity. The challenge here, according to Robert, relates to the Theory U and is about how to maintain a healthy balance between yourself and the ecosystem, between what is good for you and what is good for the ecosystem that you are a part of. In Sweden, sometimes we go too far towards the common good, losing the individuals. Even if we often have social security that handles lost individuals, this is not as good as individuals that can manage on their own and contribute to the ecosystem. At the same time there are strong forces in society that like to move us in a more egoistic direction. It is easy to prefer the Swedish model compared to more ego-system oriented models, but it is essential that there is enough space and opportunities for the individual as well. As ego-systems and ecosystems are often interconnected, meaning that there are few pure examples and thus making it hard to see the full picture, to understand. During this sensing journey we saw some interesting – and very different – examples. In addition, it is important to see the results of the ego-system with your own eyes, from environmental issues to hear stories from people that have had tough experiences. You need to experience this in order to achieve a more holistic understanding. 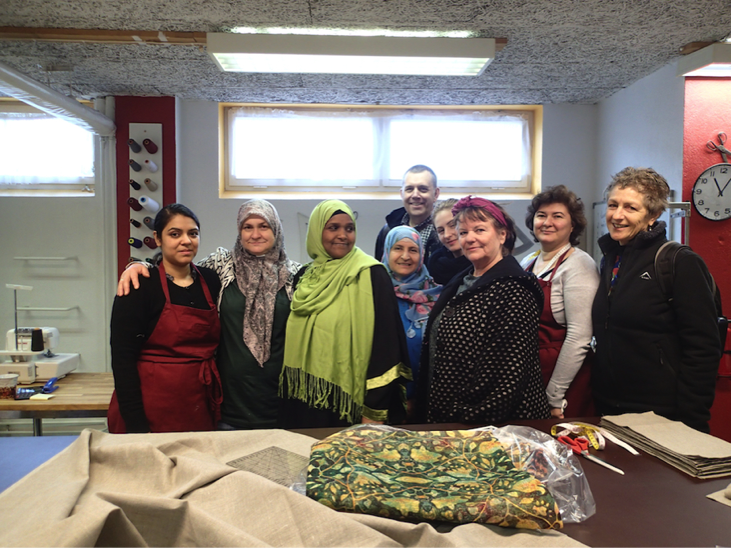 Yalla Trappan is a work integration social enterprise (WISE) active in Rosengård, Malmö. Since the start in 2010, the aim of Yalla Trappan is to provide work for immigrant women, many with poor knowledge of Swedish and with little or no education who are experiencing severe difficulties entering the labor market. Organized as a women’s cooperative, Yalla Trappan is built on democratic values such as participation, co-determination and solidarity. Instead of focusing on deficiencies and problems, the focus is on the knowledge and resources of the women. Yalla Trappan currently employs 21 women in its three commercial branches: café and catering, a cleaning and conference service and a sewing and design studio. Furthermore, it enables labour market introduction for newly arrived immigrant women by providing internship opportunities. About 50% of the turnover comes from the cleaning service, which is important because of the stability and predictability. The media attention, however, has mostly been related to the sewing and design studio, based on a number of high profiled collaborations such as with IKEA (one of only four social enterprises globally to have such an agreement) Green Furniture and Rooktown. What started out as a project with grants from the European Social Fund, the City of Malmö and ABF Malmö, has now evolved into a self-contained social enterprise utilizing the knowledge and capabilities of its co-workers to run an innovative business characterized by a strong focus on social sustainability. Over time, Yalla Trappan has become an attractive trademark that stands for social values. Among several collaborations, Yalla Trappan has established a partnership with IKEA. Recently, Yalla Trappan also managed to win a public procurement contract with Region Skåne. The city of Malmö have also decided that supporting social enterprises through project grants is problematic, so they have decided to set up a number of “public-third sector partnerships” for operations that need predictability and long term horizons – and Yalla Trappans project “Y-allas väg till arbete” is one of the candidates. Negotiations started last week. 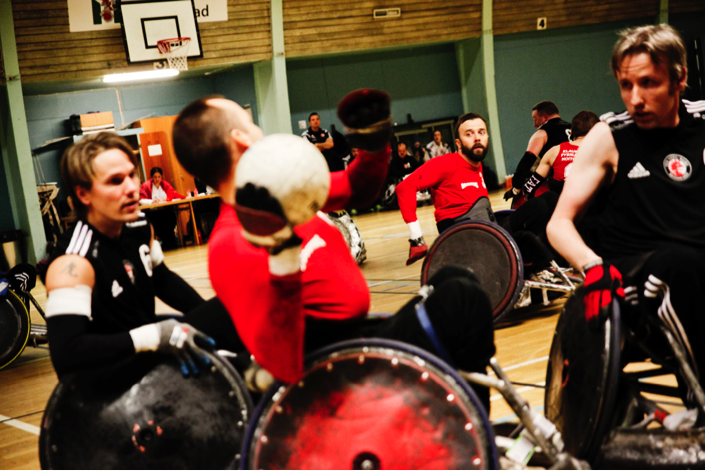 FIFH is Sweden’s largest association for sportsmen and women with disabilities, but increasingly also focus on the inclusion of disabled people in the labour market. One objective right now is to create a social business with disabled consultants who, among other things, can provide advice on accessibility. The idea is that the part of FIFH that involve sports will continue as an voluntary association. At FIFH, young people meet role models who are self-supporting and have jobs. This is important as inspiration and motivation – unemployment for people with disabilities in Sweden is staggering. FIFH also work continously with developing projects in collaboration with different stakeholders. One example is Hotel Funktionell, a project financed by VINNOVA, Sweden’s innovation agency, aiming to develop a hotel concept where people with disabilities are the “normal” guests, and also providing job opportunities for disabled people. Other projects are built on collaboration with sports organizations with disability focus in the Balkans, mostly in Serbia and Bosnia. 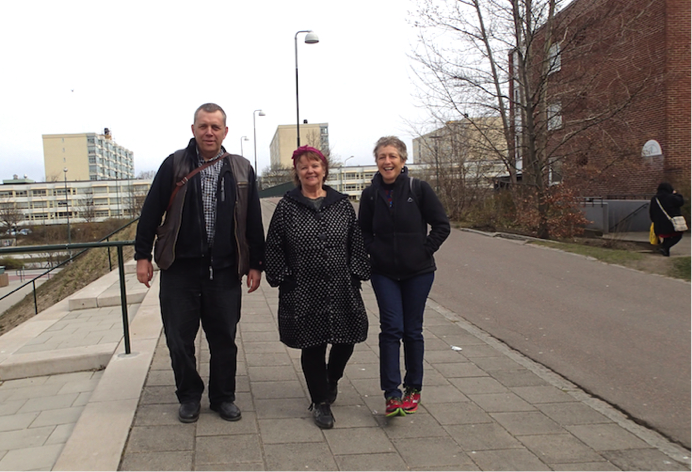 In 2009, Folkuniversitetet took the initiative together with Glokala Folkhögskolan, both third sector civic education organizations, to apply for a project grant from the European Regional Development Fund to initiate the CPE. Co-financing was provided from, among others: Skåne Regional Council, the Swedish Knowledge Foundation, Malmö University and the City of Malmö. Today CPE is in the process of turning the project into a permanent organization, which is also strengthening CPE’s autonomy. The overall objectives have been to support projects and initiatives that encourage citizen participation in both local as well as regional development, and to help build cross-sector networks that can increase collaborative governance through supporting public entreprenurship (Bjerke & Hjort 2006). Since 2009, CPE has supported the development of more than 220 initiatives. A common feature of CPE’s services is the provision of knowledge and experience for those who are starting up initiatives, which is often done by bringing a broad range of relevant local partners together to build strong coalitions. CPE also works to support networks that aim to strengthen third sector organizations in relation to the public sector. To facilitate this, collaboration with academia and developing international connections are also important activities, as well as facilitating knowledge sharing and development through workshops, conferences and seminars. Malmö is a city where the old and the new meet. A city with ample opportunities but also challenges that have shown to be enduring. From the late 19th century, Malmö was one of the fastest growing cities in Europe, with a booming textile and ship building industry. The closeness to Denmark and continental Europe also meant that Malmö was a gateway for new ideas – such as the labour movement, the dominant political power in Malmö since the democratic breakthrough in the 1920s. After WWII, Malmö became the showcase for the Social Democratic vision of how the good city and the good society could look like. 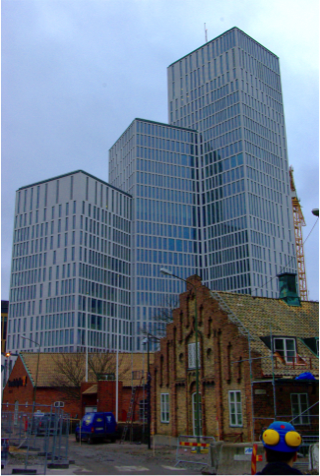 The strong industry also meant that Malmö was one of the richest cities in Sweden. But during 1960s, the tide turned. First, the textile industry collapsed, and in the 1980s, finally also the ship building. From 1965 to 1985 the number of industrial workers decreased by 40%. At first, the downturn did not lead to mass unemployment, as new jobs were created in welfare services, schools and trade, but in 1994 unemployment reached 16%. It was clear that ”more of the same” – traditional industry – wouldn’t do the job. There was a need for new lines of thought – Malmö as a city of knowledge. To achieve this, a new university was created (the closest university have previously been in Lund, some 20 kilometers away), Malmö University, with a cross-disciplinary approach and a focus on contemporary societal challenges. The concrete measures also included massive investments in infrastructure, such as a bridge between Malmö and Copenhagen, completed in 2000, and also a new commercial/residential waterfront development: The Western Harbour, which was supposed to be a showcase of sustainable urban development. Today’s Malmö is a visibly multi-ethnic city: More than 50% of the residents are either born abroad or has at least one foreign-born parent, and more than 150 languages are spoken in Malmö. Malmö is also a young city, the average resident is 36 years old and 40% are under the age of 30.